Hi! My name is Julia and I live in Atlanta, Georgia which is considered to be part of the “red group” for this site. I’m in a graduate studies program learning about Science Education, and I enjoy spending a lot of time outside when I have free time, so I picked up square foot gardening (SFG) last year. I had success with lettuce, tomatoes, herbs, dahlias, and marigolds, and I had a small yield from my sugar snap pea plants, peppers, and cucumbers, but they seemed to die off pretty quickly. I didn’t have any success with swiss chard, radishes (they never grew the vegetable, just the greens) and cilantro. I tried to grow all of these things from seed. My first SFG is filled with Mel’s Mix and I plan on adding a second SFG this year. I made my plan based on some of the other plans I saw on this website, but I am still having trouble deciding when to start planting the seeds inside/outside and knowing when to harvest and replace. Any advice about my garden plan is welcomed! 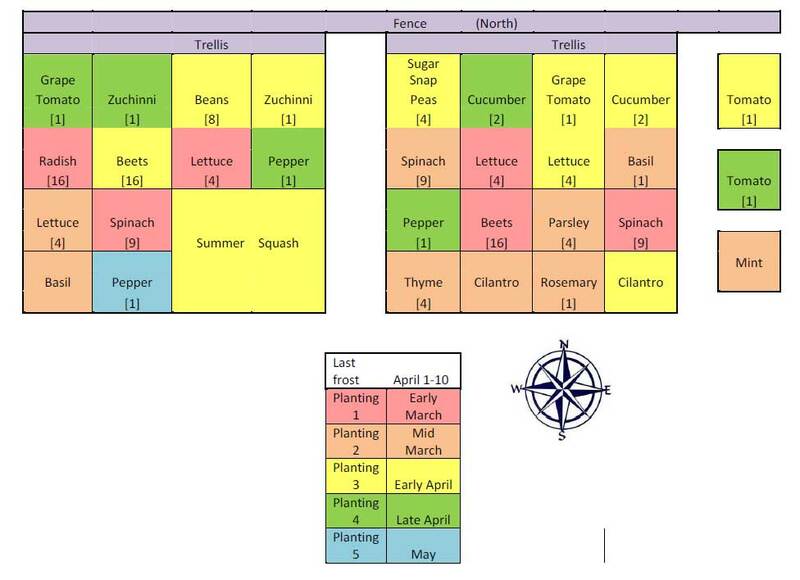 I hope I did a good job of deciding when to plant and with the companion planning I am trying this year. The three squares you see on the east side of my garden are planters that I am going to try this year as well. I am also in the Atlanta area and this year will be the first time I try my hand at this. Are the time frames that you give on your plan when you are actually planting the seeds or transplanting? Julia, would love to hear a follow up one year later! Success, failures, tricks and tips. I’m new to the Atlanta area and plan to have my first SFG this year and would love to learn from your experiences. First, be sure to sign up for my newsletter–it will tell you when to plant each vegetable, week by week. The newsletter is great because it’s free! If you want to have the whole schedule in front of you, buy the e-book. *Sugar snap peas are doing to do better in the cool weather. Be sure to plant them early in the spring (almost as soon as the soil can be worked). Keep them well-watered when it gets hot, and they can keep producing for quite a while. Once it gets too hot, plant some lettuce there and after harvesting that, plant peas again. I find HUGE success when I fertilize with this 9-59-8 Fertilome Blooming and Rooting. The trick with legumes is to NOT add nitrogen. *Swiss Chard is like beets, without the roots. They are grown only for their leaves, so they were a success! Like beets, they are sensitive to boron deficiency. I sprinkle a few tablespoons of Borax over the squares and mix it into the soil before planting. It is a great green to grow, because it tolerates heat well. Harvest from the outside, and it may produce all summer. *Peppers need lots of sun, even watering, and supplements. I use the 9-59-8 Fertilome Blooming and Rooting every 6 weeks, and water with “egg shell” mix regularly. *Cucumbers appreciate the sun and heat, but NOT on the roots. Make sure the roots are a little shaded (either by another plant, or by you!) and water them regularly. They won’t do well without even watering. *Cilantro–I’ve found this really only grows in cool weather. Try planting it early in the spring (around the same time as peas) and see how it goes. Follow up again in the fall. As for succession planting, I really find the charts in Mel’s Book helpful. 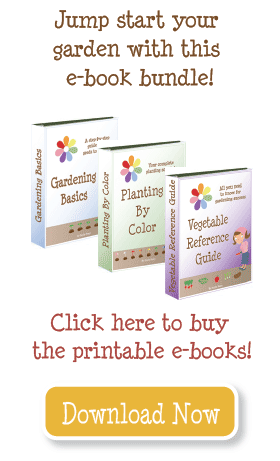 He has a schedule for year-round planting, and charts that show about when veggies should harvest. *I have not had success trellising zucchini, but have had moderate success pruning and staking it. I suggest you give it a little more space–I find it takes at least two squares. You can treat summer squash in the same way to save a little space. *I think you can plant snap peas way earlier than you have scheduled. According to my Planting By Color schedule, January 25 is the soonest you can plant this in your area. If you wanted to grow onions, you would plant those at the same time. *Great call to grow mint in a planter–it spreads like a weed! *Peppers and tomatoes should be planted all at once (about 3 weeks after the last frost). They continue to produce all season (if you plant indeterminate tomatoes) so there is no advantage to succession planting. My experience with succession planting is that it’s good to simply dedicate something like 4 squares to lettuce. Plant them every 2 weeks. Once you’ve finished harvesting one square, replant. Lettuce doesn’t like the heat, though. And spinach needs cooler temps too. So if it gets too hot, plant carrots, green beans, or green onions instead. They will all harvest in 8-10 weeks, then you can replant lettuce and spinach. I had trouble with peas, beans, peppers and cucmbers too. Interestingly, the few plants that were in sub-prime, early shade spots did much better than their “ideally” placed sisters. I concluded that our mid/late summer sun is just too intense here in Colorado when the temperature rises above 90 degrees F. I’m going to plant them in similar spots where I know that lettuce and raspberries grow well and see if that helps. I’m also going to use a lot more mulch on the soil to keep their roots cool. Good luck! The secret with sugar snap peas is to harvest often. Also, when one plant starts blooming, I plant another to keep the rotation going. Once a plant stops producing, rip it up and plant another seed.